Having spent a couple of seasons in Braavos, Arya Stark's return to Winterfell has been the cause of some joyous moments in recent seasons, including a Frey revenge and several reunions. If you haven't yet watched Game of Thrones season 8, episode 1 “Winterfell”, be warned that there are significant spoilers ahead. The reunions continued in Game of Thrones season 8 premiere, as the younger Stark daughter came face-to-face with Jon Snow, Gendry, and Sandor “The Hound” Clegane, whom she hadn't seen since seasons one, three and four, respectively. The Jon-Arya reunion was naturally emotional, given their closeness out of being the only Stark children who understood each other back then, but it was with Gendry that Game of Thrones delivered a more important scene, at least in terms of what's to come. Down in the Winterfell forges, Gendry noted to The Hound that it wasn't easy to make the dragonglass axe he had asked for, which the latter saw as being a boast and pointed out the usual social standing of those who make weapons for the wildlings. Before Gendry could muster a reply, Arya intervened in their conversation. The Hound and Arya exchanged some fraught lines that betrayed Clegane has some respect for the Stark girl, before he departed. Gendry and Arya then exchanged some awkward pleasantries, which a subset of fans would love to read into as the potential start of a relationship, before settling into a more comfortable groove, with Gendry rubbing in Arya's highborn status. Arya then took out a piece of parchment, which she termed her “wish”, and handed it to Gendry. And it's what was on it that feels important. 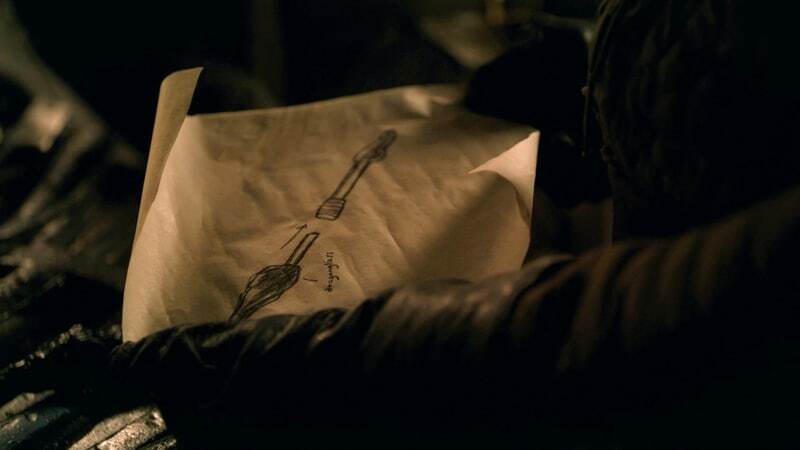 The paper contains a design for a new two-part weapon, whose one end is clearly supposed to contain a dragonglass blade and can be detached, as Arya has marked. Audiences have been shown the finished weapon as part of the full-length trailer — albeit shrouded in darkness and motion blur — that was released last month. Put the two together, along with Arya's training with a staff in Braavos, and it seems like Arya is looking to create a double-ended spear. It will have dragonglass at one end and possibly her prized Valyrian steel knife at the other, both of which can be detached at any given moment. That would allow the short Arya more manoeuvrability and the option to use her height as an advantage, as she did when she was sparring with Brienne of Tarth in Game of Thrones season 7. We will have to wait for the second or third episode of Game of Thrones season 8 — airing April 22 and April 29, respectively — to confirm our guesses (or be proved wrong).